There is no Part I, but this Part II is a logical follow on to yesterday's item about Logan Botanical Gardens. 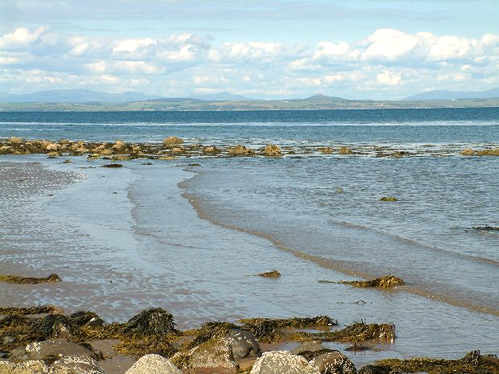 The first picture is of Ardwell beach: Port Logan is on the west coast of the Rhinns of Galloway, and Ardwell on the east. The west coast of the Rhinns takes the brunt of the incoming Atlantic weather fronts as well as the warm waters in the tail end of the Gulf Stream. The west coast is blunter, more rugged, and entirely up to its job, whereas to the east in the lee of the weather the coast is gentler and less rugged. Most of the beaches hereabouts have few if any vacation visitors . If you go there you will be able to beachcomb in majestic solitude, because the beaches of Galloway also provide some of the most interesting flotsam and jetsam you might hope to encounter on the coasts of Britain. 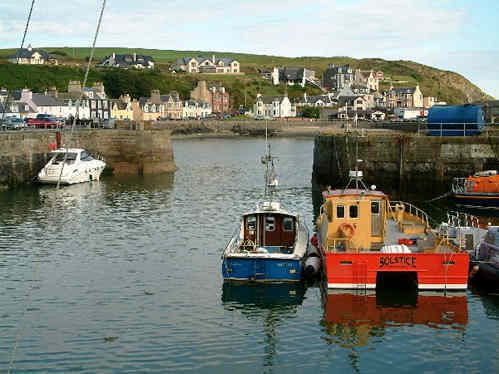 Portpatrick on the west coast of the Rhinns faces directly to Ireland, often receiving a blast of wind and salt water for doing so. It was the original point of departure for journeys to the Emerald Isle, but after some maritime disasters, and the general problems of sailing in stormy waters to begin the journey, the ferry services were relocated in the sheltered and calmer waters of nearby Loch Ryan, based in the ports of Stranraer and Cairnryan. The town still has a delightful feel of crusty old salts and derring-do, but also amenities for vacation visitors. When I lived there we went as often as we were able to afford to a restaurant that had great food with a very relaxed atmosphere in its elegant glass atrium covered dining room. 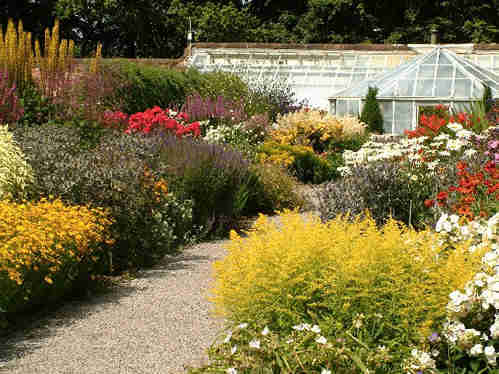 The third picture was taken in the walled gardens attached to Threave House. Lying just outside the town of Castle Douglas, whose name comes from the most prominent family hereabouts, the infamous Black Douglas clan whose emblem was a heart, the place is another chapter in an ancient history. The family greeting, 'Welcome Tae Ma Hoose', carried the risk of being thrown into the dungeons of the Douglas stronghold on Threave Island in the River Dee, built in 1369 by Archibald the Grim. The castle is now in the care of Historic Scotland. In more settled times the modern Threave House, a Scottish Baronial style mansion, was designed in 1871 for Liverpool merchant named William Gordon. The gardens were laid out by the original owner, though in the care of the NTS (National Trust for Scotland - some browsers have difficulty with this web site) they have become a center of excellence for students gardeners and landscapers , and a major attraction for vacation visitors. When we visited many years ago there was an amazing wall trained and fruit bearing apricot tree. AR Devlin's South West South West Images Scotland Photo Library has a Threave gallery, which gives an idea of the garden's richness. Those who enjoy walking may like to try the Threave Estate walk, or even use the SUW (Southern Upland Way) to link the region's gardens on a spectacular hike of heroic proportions. Cyclists may like to try the route suggested by Skye House's cycle routes library based in nearby Kirkcudbright. A more leisurely tour of the area by motor car is available from the motoring organization AA Travel. Austrian movie star (1947- ). This big man began as a body builder, where his determination led to a world title. Equally determined to become a movie star he emigrated to America, but his thick accent and foreign sounding name delayed success until his barbaric big break. He was considered for the title role in the 1970s TV series 'The Incredible Hulk', but was reportedly deemed not tall enough. His former body building competitor, Lou Ferrigno, ultimately won the part. Undeterred he starred in alternating over the top hero roles with family friendly comedies because as he says himself, "I will be back!" He was the first private citizen in the US to own a 'Humvee' (High Mobility Multi-Purpose Wheeled Vehicle - now known as a 'Hummer'). When it was asked where he parked such a huge vehicle, his spokesperson replied, "Anywhere he wants!" Information on the IMDB (Internet Movie Database) web site was used in the preparation of this mini bio. These pictures of James Bridger (1804-1881) are the most commonly seen pair of three portraits widely available on the net. I have been unable to ascertain their owners, though I guess by now they must be out of copyright. If anyone claims or notifies ownership I will be pleased to give full credits and provide links to their true home pages. Jim was born in Richmond, VA on St. Patrick's Day in the same year that Lewis & Clark stopped at Waverly, MO to repair their oars on a journey up the Missouri River that was to herald the opening of The West. When he was only twenty years old, Jim was the first white American to see the Great Salt Lake. He was a trapper, trader, scout, map maker, and teller of tall stories. He died in Independence, MO on the farm he bought for his 'retirement', revered by his contempories as 'Old Gabe'. Surprisingly many Americans I have spoken to either did not know his name, or were unsure of just who he was, when he lived, and what he did. Over the next few days I hope to provide all that information, with links to the best Jim Bridger resources on the web. This was the first of three parts, all now available in the Jim Bridger archive.